Pack of 1, set of 2 slave leads, 5 metre long, 266 strand 0.30mm, 20mm² cable, 135A cable, PVC insulated. 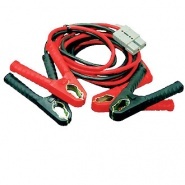 Car jump leads or battery boost cables in various sizes from car jump leads to heavy duty commercial or industrial vehicle jump leads, including the Durite range of professional engineer jumper leads. 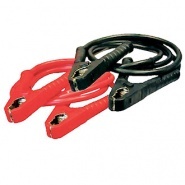 Pack of 10, universal battery jump leads, silicon insulated 10A cable with 25A clips, length: 600mm overall. Pack of 1, set of 2 slave leads, 2.5 metre long, 266 strand 0.30mm, 20mm² cable, 135A cable, PVC insulated. 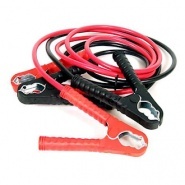 Pack of 1, set of 2 slave leads, 2.5 metre long, 322 strand 0.30mm, 25mm² cable, 170A cable, PVC insulated. Pack of 1, set of 2 slave leads, 5 metre long, 322 strand 0.30mm, 25mm² cable, 170A cable, PVC insulated. 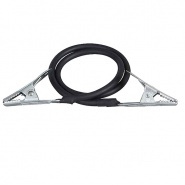 Set of heavy duty slave leads 5M long, 25mm², 170A, fitted 0-431-75 connectors at 1M in line, 322-0.30mm, 25mm² cable 170A cable. 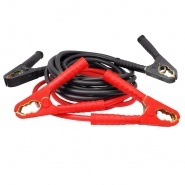 Pack of 1, set of 2 slave leads, 2.5 metre long, 539-0.30mm, 40mm² cable, 300A cable, PVC insulated. 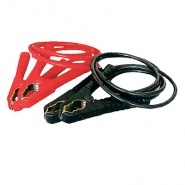 Pack of 1, set of 2 slave leads, 5 metre long, 539-0.30mm, 40mm² cable, 300A cable, PVC insulated.